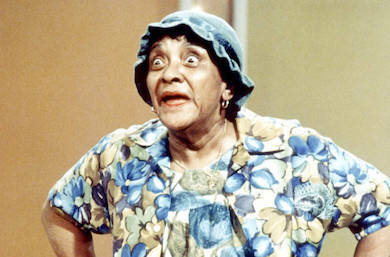 Jackie “Moms” Mabley found fame and fortune as a stand-up comedian during the twentieth century. Beginning as a staple on the chitlin’ circuit and late night talk show favorite, she went on to become an internationally known entertainer whose career spanned five decades. One of twelve children, Mabley was born Loretta Mary Aiken on March 19, 1894 to businessman and volunteer firefighter James Aiken and Mary Smith, a stay-at-home mother in Brevard, North Carolina. When Loretta was eleven, her father was killed in an explosion, and later her mother was killed on Christmas day by a truck. During her adolescence, Loretta was raped; both episodes resulted in pregnancy and the children being given up through adoption. Mabley relocated to Cleveland, Ohio, at age fourteen and joined the black vaudeville scene as an all-around entertainer. While on this circuit, she met and fell in love with fellow performer Jack Mabley. After the short-lived love affair, she adopted his name. The sobriquet “Moms” came a short time later as other performers noticed her protection and kindness for budding entertainers. In 1921 Mabley began performing with the married duo, Butterbeans and Susie, which led to her debut at Harlem’s Cotton Club. During the early 1930s, Mabley established herself as a stage performer. She worked with a number of celebrities, including Zora Neale Hurston in Fast and Furious: A Colored Revue in 37 Scenes. In 1933 she costarred in Emperor Jones alongside actor Paul Robeson. By the end of the decade, she became the first female comedian to perform at the Apollo Theater. By the 1950s Mabley earned $10,000 a week at the Apollo, making her one of the most highly paid performers of that era. She would also appear there more than any other entertainer in the history of the theater. At one point in her career, Mabley favored an androgynous wardrobe, and much of her comic material was laced with lesbian-infused connotations. Later she presented herself as a toothless, matronly-looking woman in ragged attire and floppy hats. She was known to tackle controversial subjects like U.S. race relations, sexual allusion, and her attraction to younger men. Mabley recorded several albums in the 1960s beginning with her 1961 debut, The Funniest Woman Alive. Moms Mabley at the “UN,” which was also recorded in 1961, cracked the Billboard Top 20. Mabley never married but was known to have affairs with women. She also had five more children. On May 23, 1975, Mabley passed away following a heart attack in White Plains, New York. In 2015 Mabley was named one of the thirty-one icons by Equality Forum. Later that year, she, Richard Pryor, and Redd Foxx were inducted into the Apollo Walk of Fame, marking the first time non-musical artists were bestowed with the honor. Jason Ankeny and Moms Mabley, Moms Mabley biography,(San Francisco: All Media Network, LLC, 2015); Allison Keyes, "The Apollo Theater to Induct 3 Black Comedy Legends Into Its Walk of Fame: Moms Mabley, Redd Foxx and Richard Pryor will be honored the same night the legendary theater kicks off its new comedy club" http://www.theroot.com/articles/culture/2015/10/apollo_theater_walk_of_fame_moms_mabley_redd_foxx_and_richard_pryor_1st.html; Mekado Murphy and Whoopi Goldberg, "The Comedy Pioneer in the Floppy Hat: Whoopi Goldberg’s Documentary on Moms Mabley," http://www.nytimes.com/2013/11/17/arts/television/whoopi-goldbergs-documentary-on-moms-mabley.html?_r=1 Biography.com Editors, Moms Mabley Biography: Comedian (1894–1975), http://www.biography.com/people/moms-mabley-38691; Jackie ‘Moms’ Mabley, (Philadelphia: Equality Forum, 2015), http://lgbthistorymonth.com/jackie-%E2%80%9Cmoms%E2%80%9D-mabley?tab=biography. Mabley, (Philadelphia: Equality Forum, 2015), http://lgbthistorymonth.com/jackie-%E2%80%9Cmoms%E2%80%9D-mabley?tab=biography.